Samara Klar, a political scientist who studies electoral behavior, was eager to click on the Vox story, which ran two years ago, and see which experts in her field were quoted. Turns out, it was six men. “I rolled my eyes and grumbled and moved on with my day, and later that same day I received an email about an upcoming political science conference within my subfield,” said Klar, an assistant professor of political science at the University of Arizona who discussed her “Women Also Know Stuff” initiative at ASU’s Downtown Phoenix campus on Monday. Of the 10 experts on the panel, nine were men. Within 48 hours, hundreds of female scholars had registered with the site, called “Women Also Know Stuff.” The initiative had clearly unleashed a pent-up demand not only by women in her field but also from those who wanted to hear their perspectives, such as journalists and conference organizers. The site, which now lists more than 1,200 female scholars in 59 areas of political science, includes 16 experts from ASU and 10 from the University of Arizona, which houses the platform. There’s also a Twitter feed, @womenalsoknow, which lists jobs and promotes achievements. Klar was taken aback by all the attention in those first few days. “I did not want to be seen as a muckraking activist who does not focus on my research,” she said. Klar said that women are underrepresented because of “implicit bias,” an unconscious choice of who is viewed as experts, and an overreliance on already-established personal networks. She discovered this when, after launching the site, she quickly pulled together eight women to be on the editorial board and someone pointed out that they all were white. “This was a perfect example of me being a culprit of the thing that I was complaining about,” she said. The board has since expanded the board to be more representative. “I myself have organized panels. You’re organizing a panel on the Cold War and you can’t think of women who study that. It’s not that you don’t want them — you just don’t know any,” she said. In 2013, only 26 percent of guests on Sunday morning new shows were women. Only 11 percent of assigned reading in all syllabi have a woman as the lead author. Although 42 percent of graduate students in political science are women, only 26 percent of associate professors are female. For full professors, it’s only 14 percent. “Witnessing someone like you engaging in an action is an important motivator,” she said. Klar said the women involved in running the site, which they do on a volunteer basis with no funding, are now working on a “how-to” for people interested in replicating the model. She said that other sites have been launched to promote academics who are people of color and women in the discipline of history. One of the ASU professors listed on “Women Also Know Stuff” is Mary Feeney, an associate professor in the School of Public Affairs who also is the Lincoln Professor of Ethics in Public Affairs and the associate director of the Center for Science, Technology and Environmental Policy Studies. 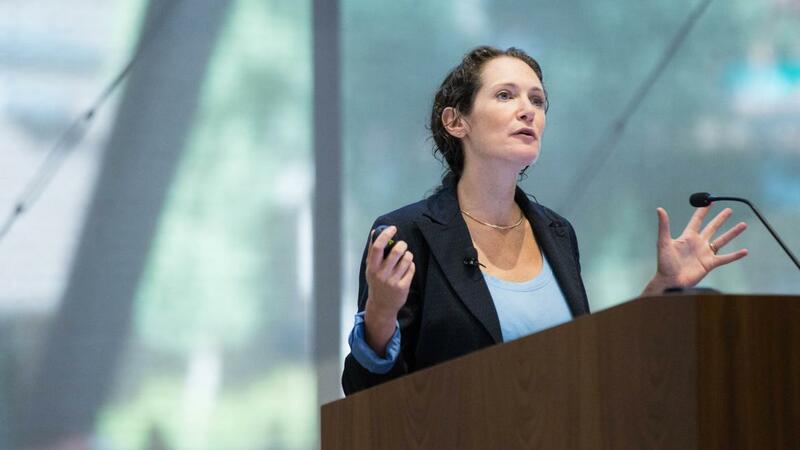 “Many of us have been told and we really want to believe that the academy is a meritocracy, where good ideas, novel research and hard work are rewarded,” Feeney said in her introduction of Klar. “So why do male academics on average make more than female academics? Why do journalists review men’s work more favorably than women? Why are female job candidates asked more questions and interrupted more frequently during their job talks? “We know there are structural and cultural barriers to the advancement of women in the academy,” she said, noting that the “Women Also Know Stuff” movement offers practical ideas. An ASU alumna, Kaylyn Adams, attended the event, which was sponsored by the Lincoln Center for Applied Ethics at ASU. She is chairman of the Millennial Outreach Committee for the nonprofit group Stronger Together AZ. “I think in a broader sense, this is very important,” said Adams, who earned a bachelor’s in criminal justice from ASU. “I’m interested in how I can build momentum to raise awareness.